Next week CNN and “Piers Morgan Live” welcome an exciting array of television newsmakers, entertainment visionaries and industry movers and shakers to guest-host our one-hour program. July 22, 2013 – Your favorite "Friend" Matthew Perry will be there for you, jump-starting the week from the New York studio of "Piers Morgan Live." "Friends" co-star Lisa Kudrow reunites with Perry on set. July 23, 2013 – American documentary filmmaker and host of CNN's "Inside Man" Morgan Spurlock takes the chair at the New York studio for a "Super Size" hour with a live studio audience. July 24, 2013 – “Today” contributor and former host of CNBC’s “The Big Idea with Donny Deutsch,” Donny Deutsch returns to “Piers Morgan Live” to host a live studio audience for the hour on race in America. Star Jones and many more join Deutsch around the table. July 25, 2013 – Top chef, foodie bad boy and host of the four Primetime Emmy nominated "Anthony Bourdain Parts Unknown," Anthony Bourdain stirs things up with our live studio audience as guest host Thursday evening. Cronuts, orange Crocs and Michelin Stars unite as Dominique Ansel, Mario Batali and Eric Ripert join Bourdain in the studio. 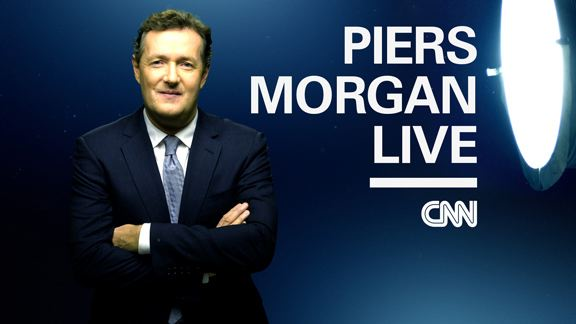 Please join us for a special week of "Piers Morgan Live" beginning Monday, July 22nd at 9 p.m.
Morgan is the biggest idiot on TV. His stupid lisp and complete lack of knowledge on what he attempts to debate are nothing short of a joke. Larry Elder did the best job in a long list of people who tell him what he is. Morgan attempts to appease all his progressive friends by sucking up to whatever they say. He is just not capable. He is the little playground weenie who gets the big guys jock strap when they are through playing. Then he wears it on his head and makes a fool of himself. When Piers first replaced Larry King, I was pleased. Unhappily, instead of interviewing popular and celebrity figures, Piers is no w spending all his air time attacking guns and following popular trials, such as Zimmerman, which are also extensively covered by all the other networks, etc. In short, his program is a bore! Wow Piers, you are really hitting a new low, you put Rachel Jeantel on your program for a whole hour??? This is worse than TMZ.com, or maybe CNN will give her a reality show when she is done talking with you. And this is Prime Time? You want to fire up the left and all the rest, so when this is over, are you going back to guns next week? OH! how I miss Larry King. And you are boring, go back to England, and may God save the Queen. Why is he touting and replaying this interview? Not trying to be obfensive or pick an argument but Jeantel is either high as a kite or retarded. Sorry but Piers wont be an winner no matter how much they try to push it. Pierce Morgan needs to be put on Royal baby watch. Oh wait, maybe that he will be having guest hosts. Revoke his visa and send him back from whence he came. He does not know American culture and we do not need him here. Terrible interviewer and a full blown a .. kisser. When did you you know you experienced true love?? NEVER with Pierce and creepy,creepy. No bueno for CNN. Bob Jenkins, I agree with everything you say. What talk show host in their right mind would interview a sluggish, uneducated, inarticulate peabrain like Ms. Jeantel more than once? The Zimmerman trial might have had a different outcome had Trayvon had a girlfriend who could string two words together with youthful energy and charm. As it was one thought "What sort of 17 year old chap has to sink to a girlfriend at THIS level?" I have been watching the Piers Morgan show since it aired. I can't watch it anymore without getting angry at the way he constantly interrupts his guests. He never lets them finish their answers to his questions. I thought in the beginning it was because he was new to this format, but it is constantly happening. A good talk show host/interviewer should know how to listen. Morgan is not a good listener. Larry King knew how to listen and get his guests to reveal themselves. His interviews were amamzing. Larry King allowed people to speak, and his interviews were memorable. Piers Morgan is an extension of Anderson Cooper. The same topic is repeated for another hour and then sometimes Anderson comes back and just repeats everything for a third time. 3 hours (Programming in my country is not always consistent)! When I started watching the Rachel Jeantel interview and watched his patronising and condescending manner, I decided to switch of Piers Morgan forever. CNN needs to find another Larry King – should have taken his advice and replaced him with Ryan Seacrest.